So, another academic year is over and a load more of my students graduate tomorrow. Hooray! That’s that sorted then. I’ll spend the summer taking some time out at the beach and working on things for the Learn @ On Stage Lighting Guest List which if you haven’t already, you might like to join in with. As you’ll know as an On Stage Lighting reader, things ‘Front Of House’ here at On Stage Lighting have been slow and steady in the last few years while I work on other projects. But I’ve not been idle and have got some great ideas for stuff coming up and some of this involves taking more interest in working with video content and YouTube. Before I start my Summer of Video, I’d love to hear your ideas and wishes for particular areas of video learning content. 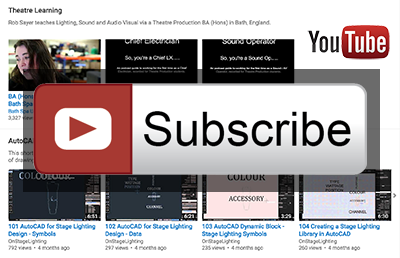 So, add a comment in the comments section below or if you don’t fancy putting it out there in public, email your wishlist to me at editor @ onstage lighting dot co dot uk. It would be great to hear from you. PS Don’t forget to SUBSCRIBE to the YouTube channel to see the results! I am very much a traditional lighting designer and now a days concentrate on pantomime. One issue I struggle with is a transformation scene where you fade from front of a gauze to the rear. I would be interested in what lanterns and Technics you would use to achieve this effect. Re: gauze transformations. Great idea, Ian. I have some podcast content on gauzes, I’ll see what I can get together. Thanks for your comment. In my one-man music show I have developed a complete stage lighting show that brings full motorised DMX lights with front spot, moving gobos, a back hydra array and full stage wash, all individually scripted to over 200 songs. The entire thing takes about 3 minutes to setup but I have one little gremlin that is driving me nuts! My front spot is flown from a boom that is attached to a study truss stand behind me (or rather, the stool I perform from). The whole setup is flexible to accommodate a variety of ceiling heights. I just attach the boom and crank the truss stand up to height. Problem is – this changes the aiming of the spot. I can easily manipulate the boom to correct the aiming for each venue but I don’t like to turn the spot on – it ruins the surprise for the audience who is watching me fiddle around with gear, then the show starts, the house lights go down and wow! You get the idea. SO, I want a small laser pointer that I can attach to the light and activate remotely to act as a…well a pointer to aim the light. Ever heard of something like that? Have any ideas on how to build something like that? The High End Studio Spot 250 had a laser aiming option but not sure that kinda thing was particularly popular. They are still around if a bit old, but not all were shipped with the laser. How about just gaffa taping a laser pen to the casing and leaving it on?